The shape-based classification system has brought significant and rather intricate changes to sending many First-Class mailings. Postage rates are now based not only on weight, but also on the shape of First-Class Mail and parcels. Mail that fails to meet any of the shape-based pricing minimum or maximum dimension classifications for standard mail are subject to additional surcharges. NOTE: The cost to mail a standard post card or standard First-Class letter sent to or from Alaska or Hawaii is the same amount as those sent to any other U.S. state. Postcards (postage is 32¢) 6" 4 1/4" 0.016"
* If your letter exceeds any of the above letter dimensions it will be classified and priced as a large envelope (flat). All First-Class Mail nonmachinable letters are subject to a 20-cent nonmachinable surcharge. ** If your large envelope (Manila, Tyvek and other similar large, flat envelopes) exceeds any of the above large envelope dimensions it will be classified and priced as a package. Large envelopes must be flexible, rectangular and uniformly thick. A large envelope that exceeds 13 ounces is classified and priced as Priority Mail. NOTE: Mail that has clasps, strings, buttons, or similar closure devices, or mail containing items such as pens, pencils, loose keys or coins that cause the thickness of the mailpiece to be uneven, may incur a nonmachinable surcharge. Items that are too rigid, too small, have excess corner radius, or irregular shapes, such as square envelopes, or tubes may also require additional postage. Postcards (postage is 32¢) 5" 3 1/2" 0.007"
Letters (45¢ for 1st ounce) 5" 3 1/2" 0.007"
Large envelopes (Manila, Tyvek and similar large, flat envelopes) 11 1/2" 6 1/8"
Visit our comprehensive list of U.S. Postal Service mail holidays - UPS holidays - FedEx holidays - DHL holidays. Information on rate changes and postage increases can be found at U.S. Postal Service Rate Increases and Proposed Changes. NOTE: Internet Accuracy Project is not affiliated with the U.S. Postal Service, UPS, DHL, FedEx or any other mail or parcel delivery company. We provide this list of two-letter Postal Service state abbreviations in an attempt to prevent the further spread of erroneous data based on misinterpretation of the U.S. 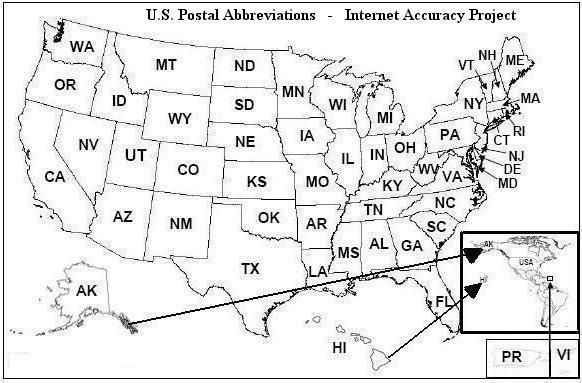 Postal Service state abbreviations. You'll also find a list of two-letter Canadian province abbreviations for your Canada Post mailings. Some of the most commonly confused Postal Service state abbreviations are, Michigan (MI), Minnesota (MN), Mississippi (MS), and Missouri (MO). State abbreviations for Alaska (AK) and Alabama (AL) are also occasionally reversed. * NOTE: December 6, 2001, the Governor General of Canada proclaimed the constitutional amendment changing the name of the Province of Newfoundland to Newfoundland and Labrador.